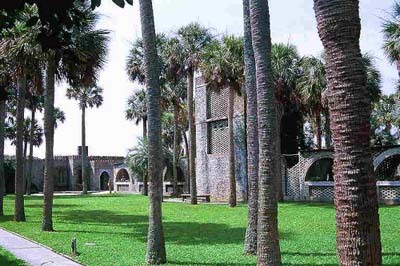 Atalaya (a Spanish word for "watchtower" and pronounced at-a-LIE-ya) is a 30 room Moorish style castle built by philanthropist Archer Huntington who started building in 1930. By all accounts, Huntington had Atalaya built without a plan on paper. Archer used only his knowledge of Moorish architecture along the Spanish Mediterranean coast in lieu of blueprints to build this unique dwelling. The local contractor, William Thomson, built the castle by following Huntington around and listening to his verbal instructions. The Huntingtons also hired locals as brick masons and carpenters. The castle grounds include a large indoor courtyard, and the former stable, dog kennels and bear pens. The Huntingtons were in residence during winters through 1941. The Army Air Corps took over the property during World War II, the couple returning in 1946 and 1947. These were the last years they used their home. The Girl Scouts of Georgetown leased it in the late '50s, and in 1960, Anna Huntington leased the home and 1,500 acres surrounding it to South Carolina Parks, Recreation and Tourism for Huntington Beach State Park.